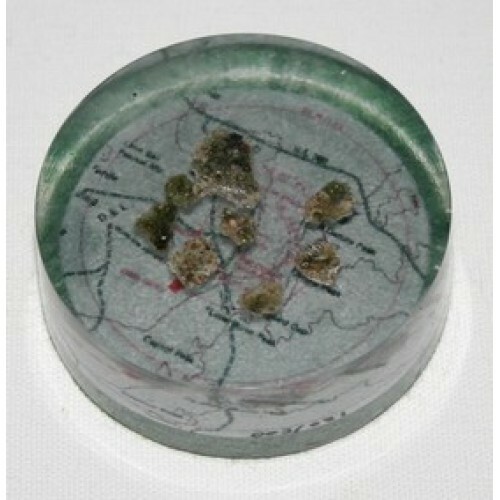 Deep inside the crystal clear resin casting is a small number of Trinitite fragments. This is the actual material created by the very first atomic bomb blast in the New Mexico Desert in the early hours of July 16th1945.This site is now the home of the White Sands Air Force Base. The sand beneath the bomb site was fused into a strange green glass-like compound by the explosion. Over the years it has lost almost all of its radioactivity and the dense resin blocks any residual emissions. The fragments are suspended over a reproduction of the US army map of the test site. This is another anythingradioactive exclusive. Trinitite from the test site is no longer allowed to be removed, so this is a rare and possibly unrepeatable opportunity to own a little piece of history from the Atomic age. 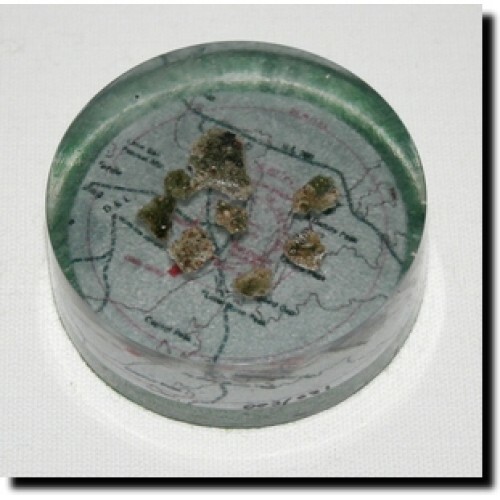 Each paperweight is hand made and measures approximately 65mm x 12-25mm, backed with green felt and supplied with an information sheet about Trinitite and the Trinity test.